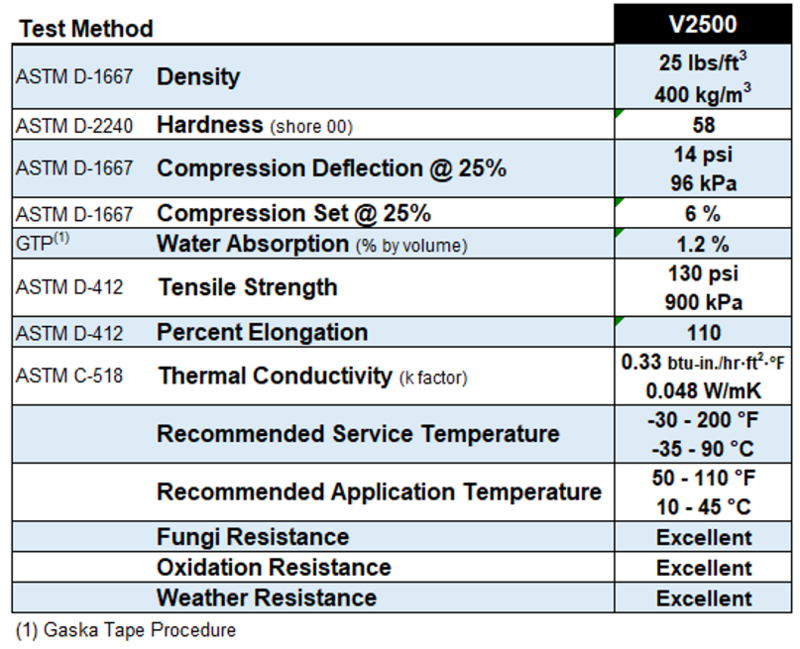 V2500 Series – Gaska Tape Inc.
Gaska Tape’s V2500 Series product is a heavy density closed-cell Polyvinyl Chloride foam. Designed for use in the most demanding foam sealing or cushioning applications. High internal strength resists pressure from outside forces and high hardness resists deterioration. Characteristics common to all closed-cell vinyl foam products include the ability to make a long life seal against air, moisture, light and dust penetration. Closed-cell vinyl foam completely seals out air, moisture, light and dust when compressed 30% or more. Our strongest standard V Series foam cushions, absorbs shock, and resists wear and abrasion in the most demanding applications. Swirl free for smooth fastener penetration. V2510 is cast on a 5 mil 83# supercalendered kraft paper. V2515 is cast on a 2 mil polyester film to provide dimensional stability, and is a self-wound product. Foam density permits exacting die cuts and ease of penetration by fasteners. V2500 Series is the best in dimensional stability of the vinyl foams. NOTES: The length of the rolls vary depending on the thickness of the material. Gaska Tape offers standard length logs. Master logs are double the standard length plus 2′ and available upon request for quote.